Us in front of Mt. 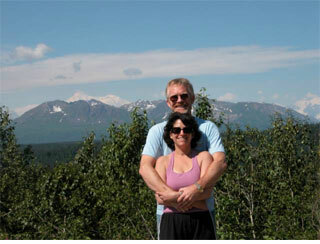 McKinley, the biggest draw of Denali National Park. In Denali National Park, the only way one is allowed in, is via bus (and no, I don't mean ours). This was not a good thing. It's not that I was afraid… more like constantly horrified. It started with the very first animal sighting, a caribou. An older woman across the isle from us let out a blood curdling scream. I thought perhaps, that the poor animal was being eaten by a bear. Since I had yet to see an Alaskan bear and there would be little I could do to help poor Rudolph anyway, I craned my neck in its direction. But, no. He of the antler bling was languidly grazing in a meadow. Then, I heard the rest of what I suppose is the tourists’ rallying cry: “WALTER! GET THE CAMERA!” Tim and I hadn’t taken organized tours in quite some time, and as we shot each other pained looks, we remembered why. “This is going to be a very long trip,” we said, in unison. What does Walter’s wife do when she needs to get his attention for something really important? Like… say she’s being strangled by a stranger, which nearly occurred several times during the eight hour trip. The rule on the bus was that anyone could yell STOP for anything at any time: animal sightings, picture opportunities, bloody noses (this really happened… they sent the kid off the bus… to be put out of his misery by a bear, I suppose. Or, is that sharks?) Our overly helpful guide/driver even got walkie-talkies for us slobs in the back, so that we could more easily communicate our wishes to him on this hell ride. Unfortunately, “Stop the bus. I’ll catch a cab” was not one of the possibilities. Then, there were the Dall Sheep. Someone would shout, “STOP THE BUS!” and we would… for dots of white, which we were told were frigging sheep on a hill. O.K. He didn’t really say frigging sheep. Being a naturalist named River, he of course referred to them as Dall Sheep. Apparently, no one on that entire bus had ever been to a farm. I've been on those tourist buses. Some long long long trips. Where are you now? sorry, that was me, Bonnie. HA HA HA HA HA!!!!! There is nothing worse for the psyche than being stuck on a bus with a bunch of tourists. That "stop" rule wasn't probably the best idea. Unfortunately it was probably put into place by management to make it seem like they cater more to their customers. That kind of power in the hands of the public is never a good thing. Sorry you had to go through that but it makes a great story. Thanks! Obviously, I'm more than willing to suffer for my art. This page contains a single entry from the blog posted on July 23, 2005 5:49 PM. The previous post in this blog was Caribou Bling in Denali National Park, Alaska. The next post in this blog is Chinese Jews.